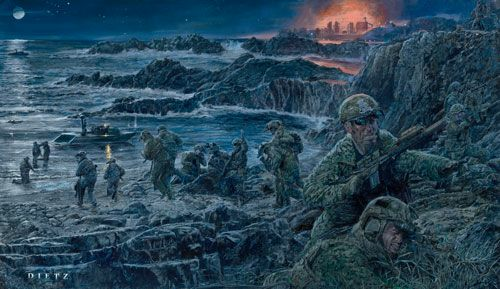 James Dietz Hand Signed and Numbered Limited Edition Print:"Abandon Self, Embrace Team (Navy Seals)"
Size: Image Size: 12" x 24" / Overall Size: 19" x 31"
In response to the September 11, 2001 attacks on America, SEAL operators inserted during the initial stages of Operation ENDURING FREEDOM-Afghanistan and carried out over 75 special reconnaissance and direct action missions. At the inception of Operation IRAQI FREEDOM, SEAL and SWCC forces were instrumental in numer- ous special reconnaissance and direct action missions. SEALs and SWCC continue to conduct operations in both theaters and are a vital component in the pursuit of terrorist networks around the globe.